I've been desperate to buy some red polishes forever. Nothing I see in the cheapo ranges appeals. Pillar box red? Excuse me while I die of boredom. What I wanted specifically was Essie Geranium and Essie Lolipop. I ordered them on eBay weeks ago and they came one at a time and took an absolute age *posts negative feedback*. 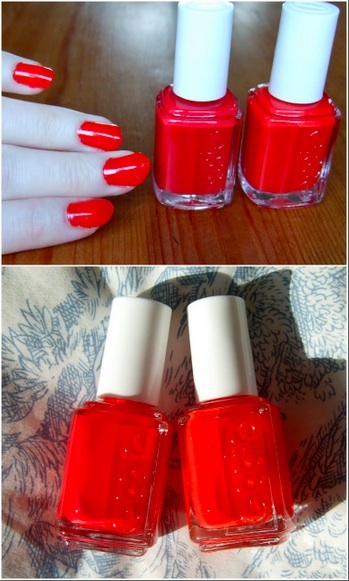 Geranium finally arrived today and I whacked it straight on – one coat, no base coat, no filing, no cuticle work. Still looked pretty good. With one layer it's slightly translucent as you can see in the photo of my nails. Not in a wishy-washy way but in a cool jelly-nails type way. Lolipop is a candy cane Christmassy red with a bit of blue in it. No shimmer. Very runny so you have to be careful that a blob of polish doesn't cruise down the wand and give you a nice, thick layer guaranteed to garner a waffle print at some point during the 35 hours it takes to dry. Oh and I watched Breakfast at Tiffany's today, hence the title. Unbelievably I'd never seen the film before but of course I loved it. Great colour, looks good on you! I like Geranium. But then, I like geraniums. How can so many people have NOT seen B@T's? ?